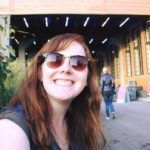 Itching for an adventure and realising her time to get a working-holiday visa was slowly running out, Lucy left the UK for Japan with a backpack, a tent and a thumb. She spent 4 months hitchhiking around the country from Tokyo to Kyushu and back again, before settling down in Tokyo with a job in marketing. Lucy’s now back in the UK working as a small business consultant and hunting for sources of mochi. When not working, she loves painting, live music and wandering around cities.